Today i have dont alot more raw food research, and i still have alot more to go. I feel like i am eating alot of the same things over and over again. However, i think i may continue to do this for a couple more days. I have a meeting with a raw cook on tuesday for a couple hours. I really look forward to seeing what she can teach me and show me! I still have white tongue and am still get a fuzzy mouth. I am so glad i have a sonic care tooth brush. Today i craved pizza. It was a very mild craving and it lasted about 10 minutes. It was weird because it has been a long time since i have craved pizza. I checked in with my family, i am not acting moody, grumpy, or out of the ordinary. I have had a bit of a runny nose and coughing stuff up. The nose i am sure is due to detox, however, i dont think the coughing is due to detox. My hands are pretty dry. They still smell like fruit or lemons or juice or coconut all day. But when i open my hand fully, i can feel the skin stretching. I dropped a pound since yesterday. Putting me at a 7.5 pound loss since March 1st. Today i got hungry very early. I had a banana strawberry spinach smoothie for breakfast. About an hour later, i got an orange. An hour after that came cucumber goodness (cucumber, lettuce, tomato, guacamole). An hour later came a fruit plate. For dinner i had another serving of cucumber goodness, an orange and some grapes. Even as i write this, i am still a little hungry. So i paused and made myself a plain avocado. 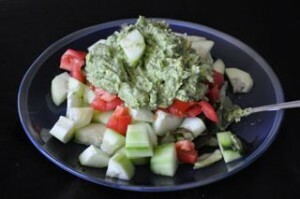 This puts me at more avocado then i want to eat in a day, but it sure did satisfy my hunger. I was craving a plain avocado all day and instead i dressed it up in cucumber goodness. Maybe i should have just given my body what it asked for instead of what i thought it should want. 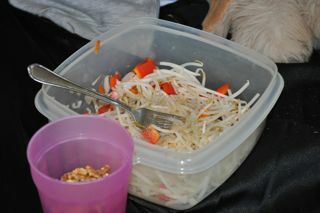 For lunch, my mom made her self some bean sprouts and bell pepper. She made a pot of hot water (tho not hotter then a 104) and put them in the water for a couple minutes. She said it felt really nice to eat warm food again. Next to her plate is some soaked nuts. Tonight I am feeling much better. I slept in this morning, really slept in…the only reason I got up was because the sun was on my face and proved too difficult to sleep through. I snacked through most of the day, primarily eating oranges. Oranges have become one of my favourite foods over the last few days. It is one of the few things that I don’t seem to get tired of and consistently settles my stomach. I need to get better at drinking more water throughout the day. I don’t think I drinking near enough for the detox that my body is going through. My cravings for regular (or at least my standard of regular) food are still frequent. At the beginning of next week I have thought about starting to add a regular work out to my routine. I am determined to make the most of this experience and feel that adding more regular exercise will only increase the benefits. While on an airplane a woman starts up a conversation with the geeky computer programmer sitting next to her. Later, the woman’s husband picks her up at the airport. “How was the flight?” he asks. 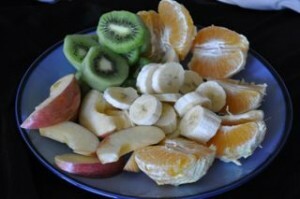 This entry was posted on Sunday, March 8th, 2009 at 3:27 am	and is filed under Raw Food. You can follow any responses to this entry through the RSS 2.0 feed. You can leave a response, or trackback from your own site.